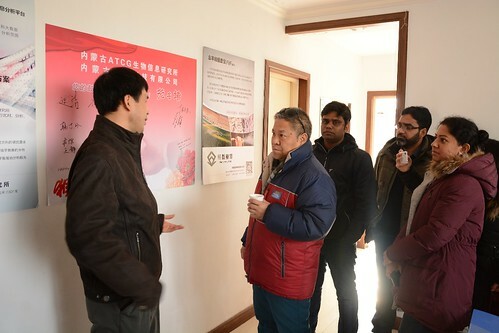 Three scientists from South Asia are taking part in a six-week research visit at the Joint Laboratory on Livestock and Forage Genetic Resources (JLLFGR) in Beijing, China. This lab is jointly run by the International Livestock Research Institute (ILRI) and the Chinese Academy of Agricultural Sciences (CAAS) and has been operating since 2004. ILRI population geneticist Han Jianlin (left) with visiting scientists from Pakistan, Sri Lanka and Bangladesh (photo credit: ILRI). The three visiting scientists are focusing on research on indigenous breeds of goats and chickens in their home countries. Faiz-ul-Hassan, from the Department of Animal Breeding and Genetics at the University of Agriculture Faisalabad in Pakistan, is working on high-density single nucleotide polymorphism (SNP) genotyping data of Pakistani goats, while Panir Choudhury, from the Goat and Sheep Production Research Division at the Bangladesh Livestock Research Institute, is working on SNP genotyping data of Bangladeshi goats. Focusing on chicken genotyping data, A Malshani Samaraweera’s research covers four countries in South Asia. She is from the Department of Animal Science at Uva Wellassa University in Sri Lanka. The research visit, which started on 10 January 2016 and ends 19 February 2016, includes working on data analysis and manuscript writing on the molecular characterization activities under the ‘GEF-Asian AnGR project’, which focuses on conservation of animal genetic resources in Asia. Specifically, the GEF-Asian AnGR project focuses on the characterization of indigenous pig, goat and chicken genetic resources in Vietnam, Pakistan, Bangladesh and Sri Lanka, using microsatellite and high-density SNP markers. In these four countries, there is a special preference for native chicken and goat meats because of their unique texture and flavour. However, genetic diversity of indigenous breeds has been in decline due to several reasons, such as neglect arising from shifts in production systems, social settings and falls in the market demand for certain animal products, increased cross-breeding to increase productivity, and rapid urbanization. Conservation of genetic diversity, underlying adaptability and potential of animal genetic resources, is thus essential to meet the changes in consumer demand and respond to the challenges posed by climate change and emerging diseases. Together with Beijing-based ILRI scientist Han Jianlin, a population geneticist, the three visiting researchers travelled to Inner Mongolia Agricultural University in Hohhot, northern China, where they were hosted and trained by Zhang Wenguang, a professor who leads a group that has worked on the genomics and genomic selection studies on cashmere goats in China for the past 10 years. The four scientists were hosted and trained by Inner Mongolia Agricultural University professor Zhang Wenguang (photo credit: ILRI). The four geneticists were trained on how to use relevant statistical (e.g. Arlequin, PLINK) and R packages for preparation and analyses of goat SNP genotyping data and they contributed reference genotyping data of 60 Inner Mongolia cashmere goats. After the four-day training, the scientists started working on the analytical procedures for their data. The group also attended an opening ceremony organized by the Inner Mongolia ATCG Bioinformatics Institute and Inner Mongolia BioNew Sci & Technology Company, two institutes that are currently developing and optimizing streamlined bioinformatics packages and platforms towards application of genomics in breeding by individual customers at low costs. The knowledge and skills, particularly on data analysis and interpretation, acquired during their visit to China will be useful in teaching next-generation scientists and conducting future research studies in their home countries. This visit will also strengthen research partnerships and collaborations, as well as build new networks targeting knowledge and technology sharing between the countries. Download the Beijing joint lab project profile. Read the article on two ILRI-CAAS joint laboratories in Beijing and Lanzhou. Tags: AnGR, beijing, China, East and Southeast Asia, GEF Asia, Han Jianlin, ILRI, ILRI-CAAS joint lab, indigenous breeds, Inner Mongolia, Livestock, Visiting scientists. Bookmark the permalink.